Holbrook to Flagstaff was down on my plan as one of my easy drives. Not many miles, but plenty to see. Unlike yesterday, where the old road was buried under the I-40, there's a few sections of real Route 66 still remaining on this drive. Sometimes, the interstate was built next to the original road, making Route 66 into what they call a 'frontage road'. Along this are many of the old businesses that served the drivers - diners, gas stations, stores . These are now inaccessible from the interstate unless you knew to take the last exit and drive the frontage road. No surprise to hear most are no longer in businesses, the buildings crumbling into picturesque ruins. One that's still holding on is the Jack Rabbitt trading post. They make absolutely sure you know to take the exit. 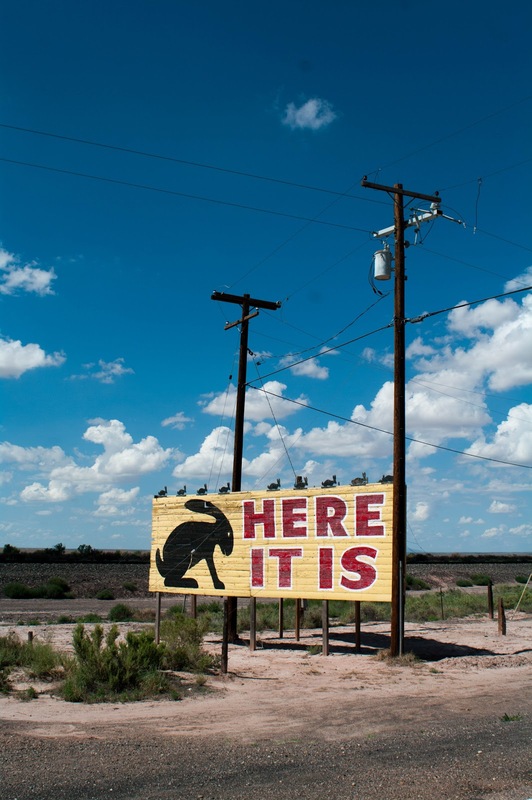 They post huge, bright yellow signs with their characteristic rabbit logo on for many miles in advance. There's not much at the store itself - the usual collection of Route 66 fridge magnets, 'authentic' Indian goods and supplies for weary travellers. But it's good to see it holding on. 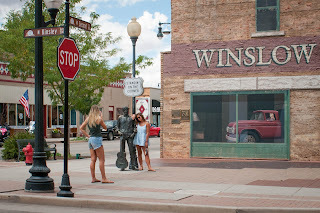 Next came Winslow, and to begin with it lived up to my expectations for a bypassed Route 66 town. Deserted motels and shells of long closed businesses. I passed all the way through on the west bound road, and was about to rejoin the I-40 when I had a nagging feeling I'd missed something. 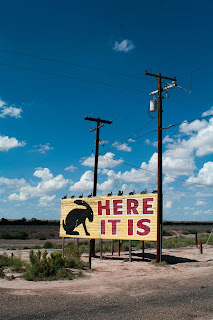 So I swung around and took the east bound Route 66 back - and find people, lots of people, all posing around The Corner. That's when it hit me. "Well, I'm a standing on a corner in Winslow, Arizona and such a fine sight to see. It's a girl, my Lord, in a flatbed Ford slowin' down to take a look at me". And there's the flatbed, there's the man with the guitar. It's a shrine to The Eagles. There's Eagles themed gift shops on the other two corners and a themed coffee shop on the other. Eagles tunes float out from the shop HiFi's. Young girls and old old bikers pose by the statue and get their photo taken. I forget how popular the song - and the band - are here. Winslow has yet more up its sleeve. 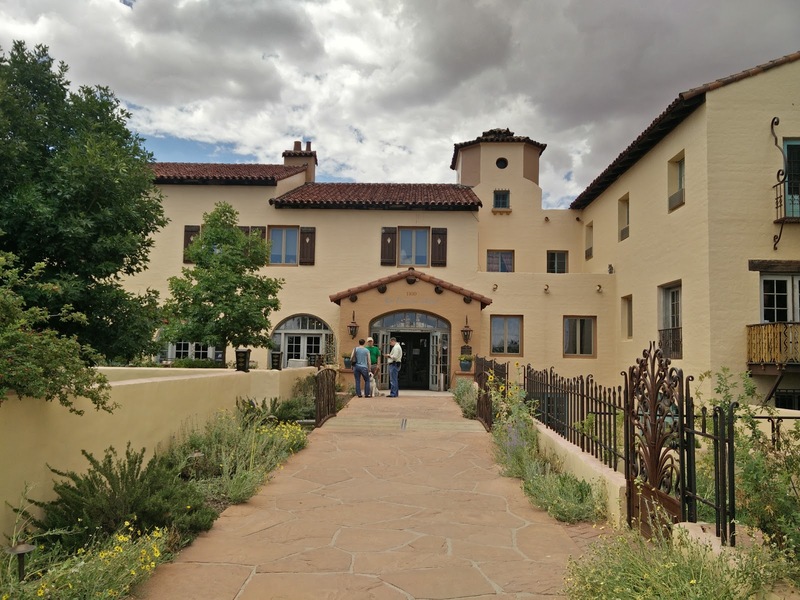 It also has the La Posada hotel, beautifully restored, a shining gem out in this dusty town. La Posada dates from a time before Route 66, when Fred Harvey's 'Harvey Houses' made train tourism a leisure activity for the up and coming middle classes. These luxurious hotels, run with military precision, appeared at major train junctions and tourist spots across the USA. Few remain - certainly not as well preserved as this one. I've long planned to write a more in depth post about how important these hotels were. 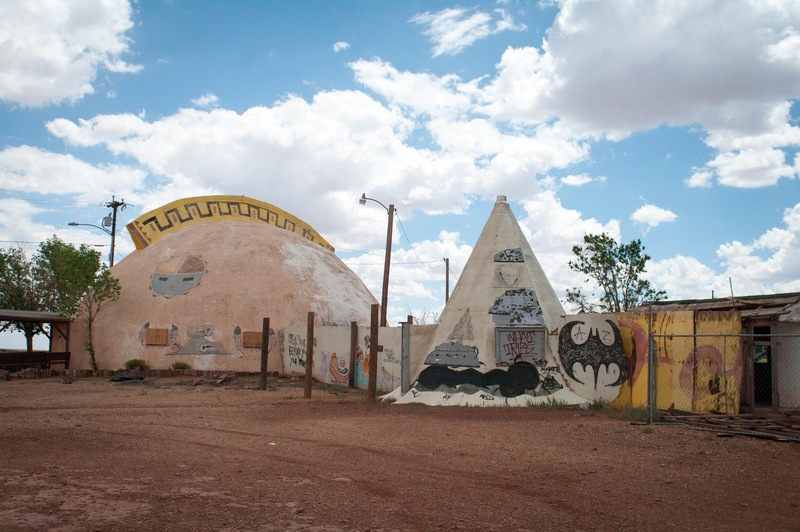 After Winslow, there's a few more ruins that are 'must sees' for every Route 66 photographer. 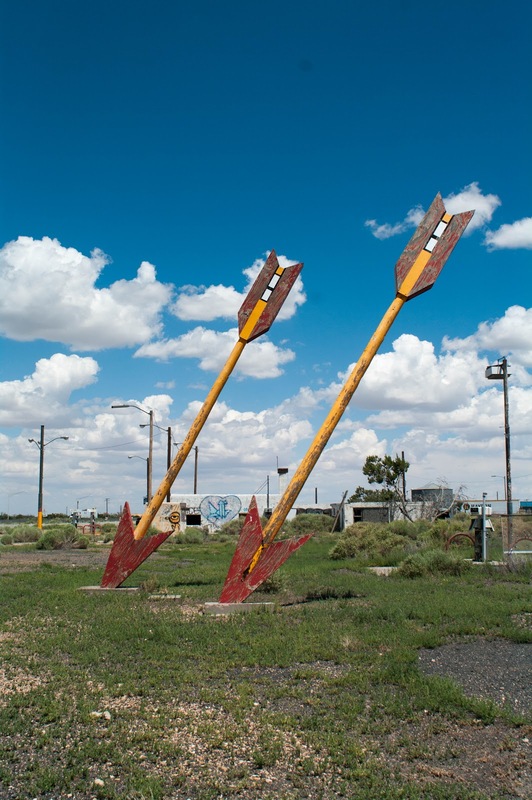 There's the once futuristic dome of the Meteor City trading post, or the two huge arrows that signpost the Twin Arrows service station. I was particularly glad to see the latter, as you only see the arrows after you've passed the exit (and can't turn round for tens of miles). This time I'd planned for it, and pulled off early, knowing it was coming up. 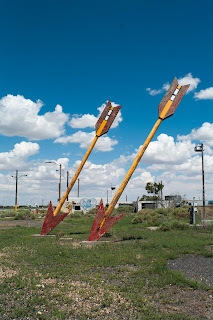 Meteor City is so named because of the huge meteor crater just off Route 66. Apparently, some 50,000 years ago, a 150ft wide meteor crashed into remote Arizona at 40,000mph. The dent is three quarters of a mile across and pretty impressive. The charge of $18 to see it is less so. From there it was an hour of bumping along on the deserted and crumbling sections of old Route 66. It skirts around hills and valleys the I-40 just ploughs through, until I reached Flagstaff. This is my third time there and the city is as charming as ever. A few compact blocks of living downtown with restaurants, bars and (mostly gift) shops. I stayed in the Weatherford, where I stayed the first time. Like the first time I wished it had lifts, as my case is heavy to drag up three flights of stairs. The rooms are tiny by modern standards, but absolutely fine. Tomorrow, it's another relatively short drive on Route 66 to Kingman, with plenty more distractions. There's nothing wrong with this place. It's an upmarket restaurant for older couples. I read my book and ate my dinner and I left without any huge impressions. 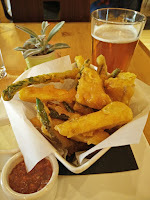 The tempura vegetables were more 'beer battered' than tempura. 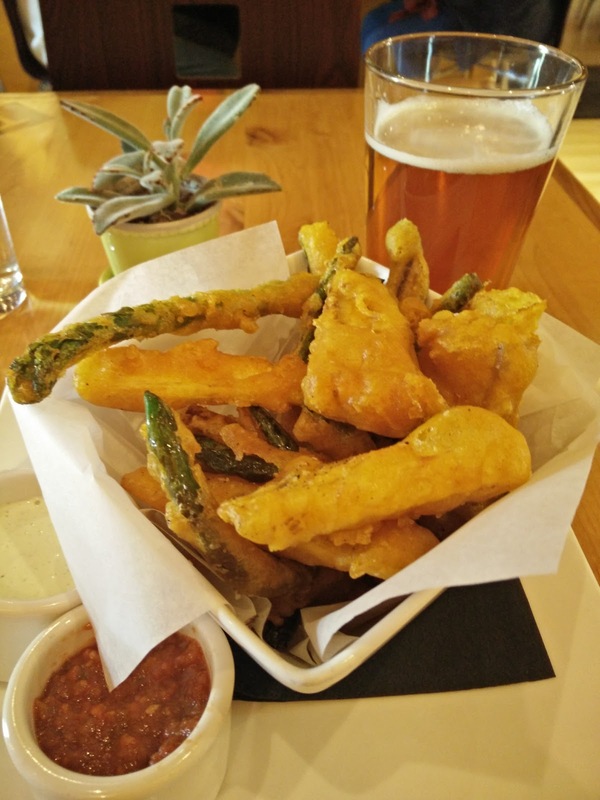 The staff were just that little bit too ingratiating, for this European's tastes. I think that happens when a restaurant wants to be taken seriously. The mac cheese and brisket was fine, but I should know better than to have brisket outside of Texas. What was I thinking?